Cover of Pep Comics 1 (Jan 1940) Art by Irv Novick. With issue #11 (Jan. 1941), "Fu Chang, International Detective", "Perry Chase, The Press Guardian" and "The Rocket and the Queen of Diamonds" ended. To replace them, issue #12 (Feb. 1941) introduced two new characters. "Danny in Wonderland", a surreal fairy-tale adventure by Harry Shorten and Lin Streeter with stories loosely based on fairy tales such as "Cinderella", "Pinocchio", and The "Little Mermaid" (#12–39), while Ted Tyler, "The Fireball" (#12–20), 'sworn enemy of all who use fire for evil purposes'  was a fireman who gained flame powers from a mixture of chemicals while fighting an arson attack. "Lucky Larson", a test pilot, filled the third place (#13–15). Further major changes came with the next two issues. "Lee Sampson, Midshipman" ended in #16 (June 1941); and Madam Satan was introduced in the same issue. Madam Satan, a dead villainess with a green face and the kiss of death, "the scourge of man, ready to go forth and leave a trail of misery and suffering in her wake" actually first appeared on the cover of the previous issue #15 (May 1941). She was written by Abner Sundell and initially drawn by Harry Lucey, although Joe Blair wrote her later adventures. Madam Satan ended in issue #21 (Nov. 1941), her place taken in #22 (Dec. 1941) by the first appearance of one of the biggest-selling comics characters of the 20th century, Archie Andrews, and what would become the core of his friends Jughead and Betty Cooper, whose family has just moved into the neighbourhood, written by Vic Bloome and drawn by Bob Montana. Over the next few years humor strips would slowly ease the costumed heroes and adventure tales out of Pep Comics, and Archie would become Pep Comics's and the Archie Comics imprint's most popular character; but for the time being, Archie was a six-page strip that was not even mentioned on the cover. Pep Comics Archie stories have been reprinted in a large number of other Archie Comics titles over the years, particularly within the multiple digest magazine titles. Some Golden Age superhero titles have been reprinted sporadically since, but the adventure and crime series have not. Most, if not all, of The Jaguar, Fly and Flygirl stories from Pep Comics #150–160 and #168 were reprinted several times in random order in a resized black and white format by Alan Class Comics in the U.K. during the 1960s and 1970s. ^ Their origins were extremely similar: both involved 'super formulae' for strength and prowess, and Nazis. ^ In October 1941 the Shield G-Man Club claimed to have 20,000 members, many of them girls: nearly 50% of readers quoted were female. 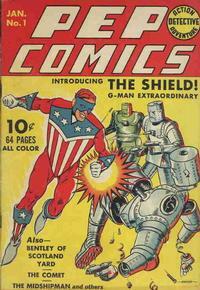 ^ Battling Axis enemies with The Shield and Dusty on every cover except #28, which he appeared on by himself, fighting Captain Nazi over the U.S.A. He was finally ousted from the cover by Archie in issue #43 (October 1943). ^ which ended in #52 (March 1945) with the lines And so the 'Golden Herring' once more sails its lonely course...To what?, to where? Who cares??? ^ Captain Commando at Don Markstein's Toonopedia. Archived from the original on April 9, 2012. This page was last edited on 29 October 2018, at 04:36 (UTC).